Circling the News supports elders and senior citizens; as a matter of fact, I even qualify for Denny’s senior breakfast—a real deal. Instead, the story was about how Brentwood developer Rony Shram received special consideration from Bonin’s office. A builder down the street from where I live told CTN after the story came out, that developers “pay to play” and their projects can go through the L.A. City process in months, not years. I have been told by several builders that a single-family residence typically takes at least nine months to go through the system and then another two months of waiting for a decision letter. Yes, there were emails to prove that this 82-unit eldercare facility had received “nice” treatment from the City via Bonin. 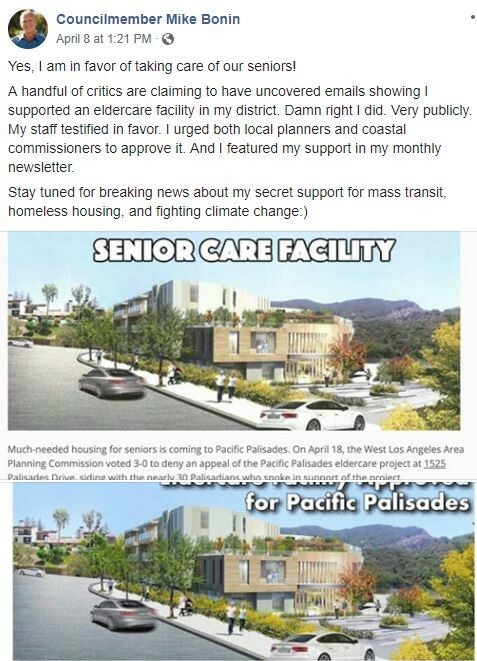 Most of the residents who oppose this project don’t oppose senior care facilities; they object to the size and massing of this one, particularly, since the building would abut hiking trails in Topanga State Park and Santa Ynez Park. Then there’s the problem of constructing a facility like this in a Very High Fire Hazard Severity Zone. If there’s a brush fire, how do you quickly evacuate the estimated 82 Alzheimer/dementia and senior residents housed in the facility? Funny enough, on March 28, when a garage door caught on fire in the Highlands, neighbors tried for almost 9 minutes to get through on 911. Instead their calls went straight to a voice message. Not to an operator, who said, “Please hold.” No, it went straight to a recording about a hostage situation. Circling the News contacted LAPD and Councilman Bonin to ask why 911 wasn’t working. We’re still waiting for answers. One can’t help but think if firefighters had responded earlier, more of the two-story home could have been saved. We’re glad that Bonin is proposing mass transit. Maybe he’s thinking of building a little train that would take residents in and out of the Highlands? Or a bus? Currently there is only one way in and out (Palisades Drive) of the community that is surrounded by brush. Or maybe he has plans for mass transit in and out of the Palisades. Currently we have only Santa Monica’s Big Blue Bus and a Metro bus, but one has to get to Sunset to catch them. Most of us are into saving the environment, which also means getting rid of plastic in restaurants, take-out places–and in certain clothes. It means reusing, reducing and recycling. You want to help the carbon footprint? Take out the petroleum that’s used in polyesters, which dominate the clothing industry. We have recycling bins on the business streets of Pacific Palisades, but none of that trash is recycled; it just gets tossed in with the other trash. Why? At a recent Pacific Palisades Community Council meeting, Mayor Eric Garcetti’s aide was asked about the City’s recycling, and where it is going since China passed the National Sword policy banning imported plastic waste (effective January 2018). Maybe Bonin knows what’s happening with plastic in L.A., and where it’s being shipped? One of my sons worked at the boat docks in Marina del Rey and was sickened to see the amount of trash that flows daily into the ocean. While Bonin is working on climate change, maybe he could also make sure that trash and plastic doesn’t flow into local waters. Yes, Mr. Bonin! Sue Pascoe has the integrity to call you out. What is your response? You’re asking some important questions, Sue. Thank you. Let’s be honest here. The Senior facility in the Highlands really isn’t about seniors. It’s the usual-MONEY and the greased palms that helped get it through. Sad. Let’s hope a catastrophic wild fire doesn’t happen; the Highlands is a sitting duck. seals to death on the ice floes.